When an contact is opted out of your email marketing, we mark the contact as unsubscribed. An unsubscribed contact can always be resubscribed if they were removed by mistake or choose to receive your content again. In this article, you'll learn how to unsubscribe contacts individually and in bulk. 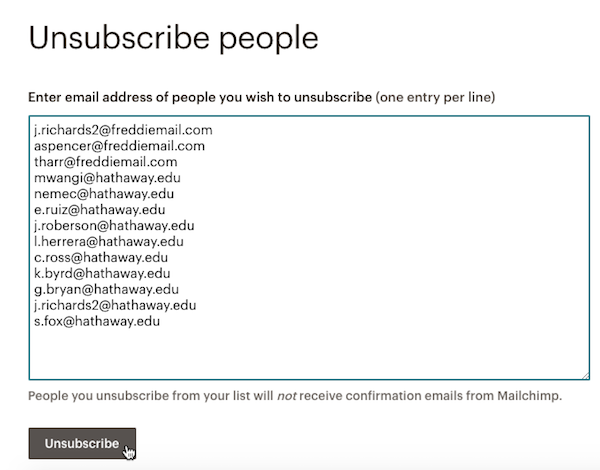 To unsubscribe individual addresses from the contact table, follow these steps. Check the box next to each subscribed contact you want to unsubscribe. 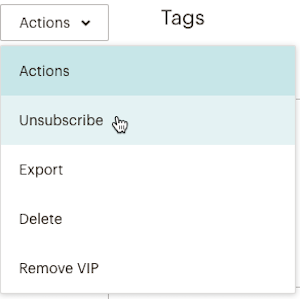 Click the Actions drop-down menu and choose Unsubscribe. To unsubscribe a single contact from their profile, follow these steps. Find the contact you want to unsubscribe, and click to view their profile. In the Are you sure? pop-up modal, click Confirm Unsubscribe. On the Activity feed in the contact profile, we'll display when and how the contact was unsubscribed. If you have a lot of contacts to unsubscribe, you can use our bulk unsubscribe tool. Paste up to 3,000 email addresses into the field at one time and we'll make sure they're unsubscribed. 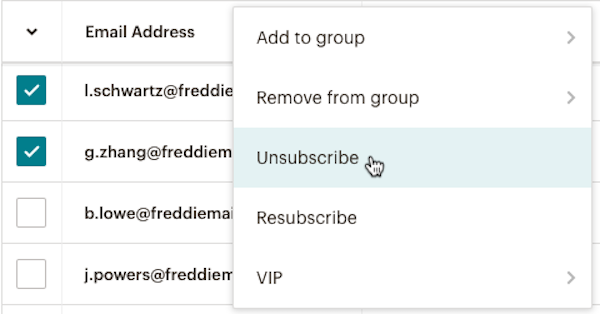 To unsubscribe multiple contacts at once, follow these steps. 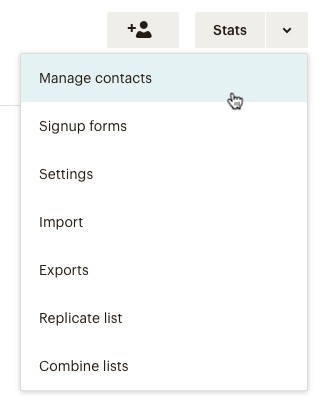 Click Manage Audience drop-down and choose Manage contacts. Type or paste in the addresses you want to unsubscribe in the Email addresses field, and click Unsubscribe. When an address is manually unsubscribed from your email marketing, we don't send them a confirmation email or unsubscribe notice. Learn how to remove one or multiple contacts from your audience.